The growth paradox: can tourism ever be sustainable? Tourism creates jobs - lots of them. In fact, one person in every 10 is employed in tourism-related jobs. When it is well managed, tourism provides an incredible economic boost to host communities. For these reasons, almost every country in the world wishes to expand its tourism sector and increase the number of tourism arrivals. 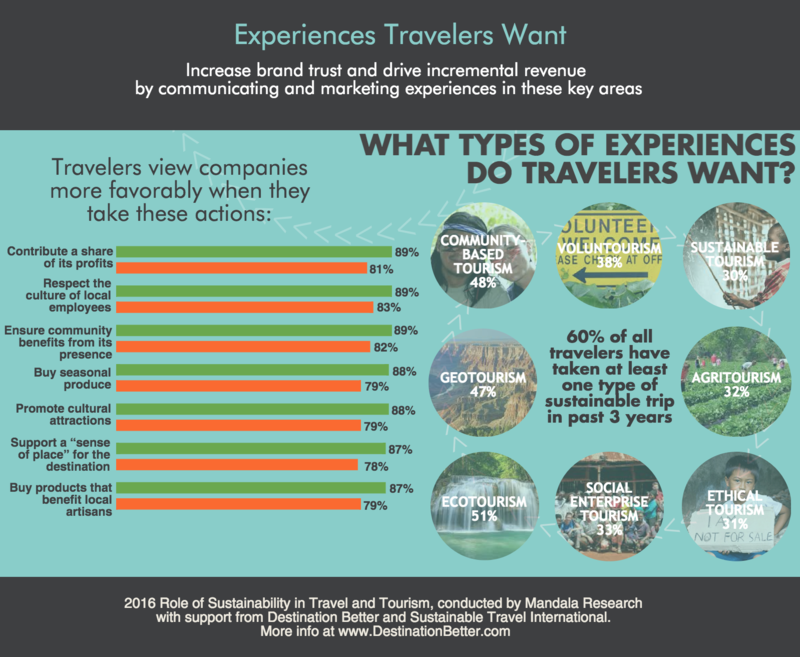 An increasing number of travellers are significantly more likely to visit destinations and make purchases from travel companies based on their sustainable practices. Many destinations have strategies and plans in place to use tourism to help alleviate poverty and conserve their natural and cultural heritage, for example, through the creation and management of National Parks and monuments. Yet nearly 50% of World Heritage sites, which are recognized by UNESCO for their outstanding universal value, do not have tourism management plans in place to prevent the negative impacts of tourism. If expanding tourism results in more jobs and greater economic opportunity, why are an increasing number of destinations around the world proposing or implementing measures to limit or restrict it? Destinations like Cinque Terre, Zion National Park and Machu Picchu are limiting the annual number of visitors. Amsterdam, Barcelona and the Seychelles are curtailing large-scale development. Bhutan and Venice charge visitor taxes and fees, while places like Koh Tachai in the Similan National Park are prohibiting visitation altogether. Why aren’t more destinations focusing on yield per visitor rather than the number of international arrivals? Why aren’t more businesses that are dependent on tourism investing in the destinations they serve and the assets upon which their businesses depend? And why isn’t the industry at large actively addressing these issues? Global tourism is expected to continue to grow as a larger number of aspiring travellers become more prosperous and their disposable income increases. It is anticipated that the sector will outperform the global economy in the course of the next decade, increasing by an estimated 4% on average annually in the next 10 years. It’s not surprising that most destinations want a bigger piece of this pie and have strategies in place to attract more visitors and visitor expenditures. Taxpayers’ money is spent on attracting visitors and emphasis is placed on volume rather than the value each visitor represents to the local economy. The net result is that the places served by ministries of tourism, destination marketing organizations and convention and visitors bureau are often victims of their own success. Travellers tend to arrive in increasing numbers and flock to the same locations, resulting in issues such as overcrowding, increased stress on public services and infrastructure, cultural homogenization and growing dissatisfaction from local residents. Ad hoc development, local capacity constraints and leakage are issues as well. The latter is the most frequently cited issue: although tourism can be a great form of wealth distribution, often as little as 5-10% of the money tourists spend remains in the destinations they visit. These issues must be addressed to fully realize the benefits of tourism through an inclusive approach and collaboration between the public and private sectors and host communities. The travel industry and governments need to acknowledge that the narrow focus on increasing numbers is a problem and creates issues and negative effects that diminish the quality (and value) of the experience for travellers and visitors alike. One could argue that tourism cannot be sustainable, that sustainability is impossible. Negative effects on the environment are inherent to the industry, such as the emission of greenhouse gases and waste generation, that are currently difficult, if not impossible, to avoid. Tourism can also contribute to water and energy shortages, degradation of water supplies and ecosystem degradation, owing to ad hoc development and weak or poorly enforced environmental regulations. From clear cutting and destruction of mangroves to excavations and construction, land use changes associated with tourism result in the creation of artificial landscapes and infrastructure. This visually degrades the scenic value of natural landscapes and results in a change in the environment, because of factors like erosion, pollution and artificial boundaries. This, in turn, can result in more erosion and increased flooding and storm damage, as well as a negative impact on wildlife migration and breeding patterns. The tourism sector attracts increased investment in airports, airlines, railways, ports, hotels and tourist attractions, particularly to metropolitan areas, cultural and natural heritage sites, and other attractive locations and landscapes. This can be good for short-term economic development, but bad for residents when tourism development is poorly executed. Historically, local and indigenous people are displaced or forced to relocate when new national parks or heritage sites are established. Prime real estate is sold to developers and local access can be restricted or lost altogether. Though jobs are created for local people, they are usually entry level and low paying with limited opportunities for upward mobility. Sustainable tourism is on track to go mainstream because it can combat the negative effects of tourism and improve lives, protect places and provide visitors with authentic experiences. But the sustainable tourism movement is as fragmented as the industry itself. Today’s pursuit of sustainable tourism is replete with small organizations and individual consultants, often battling for small-scale and underfunded projects, and scraps of success. Most players in the space have just one or two staff on payroll and the largest NGOs have fewer than 25 staff. Emphasis in the public and private sector is placed on planning and reporting rather than changing organizational or operational practices, and follow-through on sustainability initiatives is limited because of “resource constraints”. This results in a great deal of competition for the limited resources available and little meaningful collaboration. No single organization is achieving success at scale and, despite good intentions, the cumulative impact is significantly smaller than what is necessary and achievable. 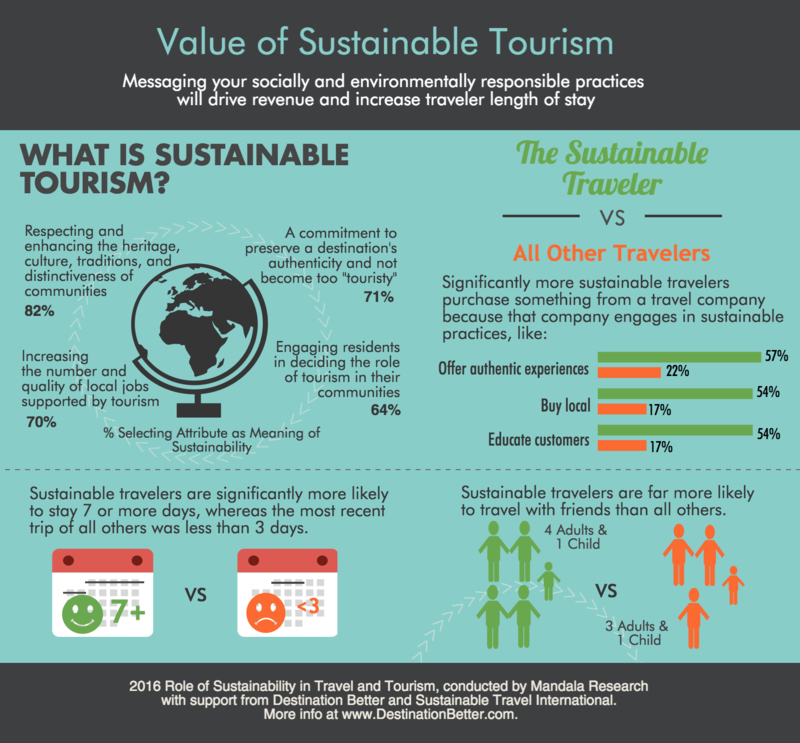 The term sustainable tourism means different things to different people in the industry. But like ecotourism, sustainable tourism has become virtually meaningless as it is often tied to cursory efforts, which are very limited, rather than organization-wide commitments, strategies, and actions. This is surprising given that the business case for sustainability and corporate responsibility in tourism is growing stronger year-on-year. In fact, the UN declared 2017 the International Year of Sustainable Tourism for Development. Tourism is featured in three of the UN Sustainable Development Goals and all 17 goals can be advanced through sustainable tourism development. This has resulted in an increased adoption of practices that improve environmental performance and social well-being. These practices lead to significant savings, goodwill among employees and customers, improved employee motivation and retention, and enhanced brand reputation. Businesses engaging in these practices also benefit from attracting customers who care about front-page issues like climate change, biodiversity loss, and economic inequality, who increasingly align their spending with personal values when price, quality and convenience are perceived to be comparable. Still, few tourism-related companies and destinations have integrated sustainability into their operational DNA. Even fewer are investing in protection of the well-spring that their business depends upon — the destinations in which they conduct their business. Overall, the tourism sector’s commitment to sustainable development is decidedly weak. It’s understandable when considering tourism, which is, like most other industries, growth-oriented and profit-driven with a relatively short-sighted approach to planning and development. The primary focus is generating a return on investment to increase shareholder value as quickly as possible, or, similar to many politicians, to appease constituents to foster the probability of reelection. The implications of this current economic and operational model is that nobody really wins. Saturation in destinations and over-capacity results in physical stress on the infrastructure and on natural, cultural, and heritage assets. Commoditization of tourism products and services results in lower margins for tourism businesses. Busy, crowded attractions and sites diminish the quality of the experience for visitors. Highly concentrated versus diversified revenues, congestion and saturation increase negative perceptions of tourism. Large-scale tourism is beginning to attract public opposition and tensions between residents and visitors are growing in many over-loved destinations, where either or both the quality of life and the quality of the visitor experience have substantively deteriorated. The problems posed by tourism are seemingly growing so fast that we can’t address them. This is a social, environmental, and business challenge. 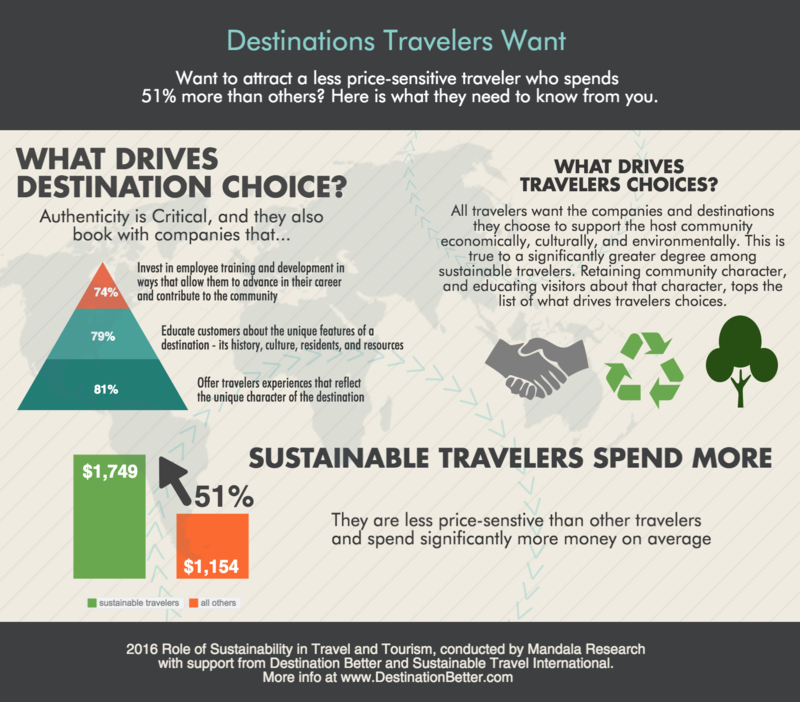 Are we moving toward sustainable travelism? Companies, destinations, and travellers need to be more aware of and held accountable for their impact. They all have an important role to play to ensure that tourism lives up to its promise to improve people’s livelihoods and protect the environments they depend upon. Each player seems to be missing an opportunity to use tourism as a vehicle for social, environmental, and economic advancement. Since there is no single stakeholder group that is solely responsible for generating economic outcomes or preserving a destination’s natural and cultural heritage, collaboration between sectors is required to catalyse the change needed to keep tourism destinations healthy. Truly innovative thinking is needed from destination authorities and business leaders working together to determine how to manage growing visitor numbers, address changing traveller expectations and shape and improve both visitor and host experiences. There is a substantial opportunity for businesses, visitors, host communities and residents to derive greater benefit from tourism. The strategic use of private, public and community partnerships, for example, supports destination-level tourism strategies, empowers host communities to protect their tourism assets and creates opportunities for private sector enterprises and NGOs throughout the tourism value chain. Residents’ well-being and the visitor experience are improved in the process. Monitoring and reporting across relevant spatial scales. Cumulatively these efforts will support science-based decision-making and help to mitigate tourism’s negative effects. Furthermore, they can reduce commoditization of the beautiful and historic places on which the tourism industry depends, while providing more opportunities for travellers and tourism businesses. When travel and tourism activities are planned and executed with the impact on communities and commerce in mind, tourism as an industry can live up to its potential as a great catalyst for economic, social and environmental prosperity.